Waiouru: Fish & Chips or Doughnuts? One advantage of being retired and living on a narrowboat is your life isn’t regulated by time. I had a lazy start this morning waking at 8.00am to the sound of a heavy downpour beating on the cabin roof. Jan had already been up for several hours and was quietly sitting in the saloon catching up on all the news with her iPad. I can see the advantages in having a Tablet but I just can’t bring myself to love Apple with their “closed shop” business model. 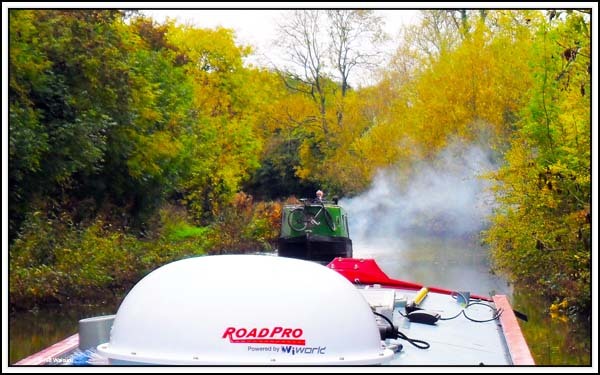 We waited until the rain stopped and then slipped away from our overnight country mooring heading towards Hillmorton Wharf with the intention of filling the diesel tanks. Along the way another boat caught up with us as we both made good time. There was a Black Prince hire boat moored just beyond Norman’s Bridge. The first thing we noticed was how close the boat was to the bridge and then we realised the crew had positioned their mooring pins on the far side of the towpath. Moreover the mooring pins looked like they had only been driven into the ground by 3 inches and the mooring ropes were tied to the eye at the top of the pin. It was obvious the pins were not going to hold the boat. Sure enough, despite us passing very slowly the boat started to drift. One crew member jumped off and re-positioned the pins almost under the hedgerow, but still failed to hammer them into the ground. I noticed the boater behind us had slowed and said something to the crew. We reached Hillmorton Wharf and could see the sign advertising diesel at 87p/ltr. I was doing a great job of getting against the wharf when Jan said to me “They’ve sold out of diesel!” Sure enough, a member of staff appeared and shouted they had sold the last of their diesel yesterday and would not be receiving a new supply until tomorrow. Oh well,,,,, it wasn’t urgent! Both top locks at Hillmorton were against us and as there was a boat following behind us Jan lifted the paddles on both locks. The boater reciprocated by closing the far side bottom gate when we left. We worked through the other two locks using the same method. Whilst we were in the second lock the other boater mentioned that he had told the Black Prince crew they needed to ensure their mooring ropes didn’t cross the towpath and they needed to drive home their pins. He then mentioned it was the same boat that had gone past him at speed earlier that same morning. Just after bridge 68 we noticed a boat coming towards us that was belching large amounts of smoke. Initially we thought it was from his solid fuel stove chimney but then realised the source of the smoke appeared to be lower. Surely the engine wasn’t making that much smoke? Then we noticed there was no smell of burning wood or coal. As the boat passed we could see the smoke was actually being emitted from under the stern counter. I sniffed the air and said “Fish & Chips” whilst Jan commented “Doughnuts”! It certainly didn’t smell of diesel…..? The contractors are still working at Brownsover. My guess about the drainage pipe might just be correct. 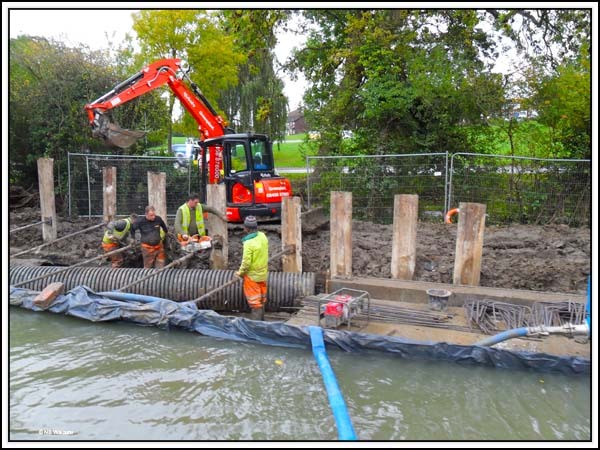 The coffer dam is still in-situ and it looked like a section of the drain pipe was being replaced. The boater who had been following us suggested we look for diesel at Lime Farm Marina on the far side of Newbold Tunnel. Meanwhile we have moored to restock the galley cupboards from Tesco. I suppose the Apple business model is also the reason why no anti-virus software is either available or needed for Apple computers and tablets. 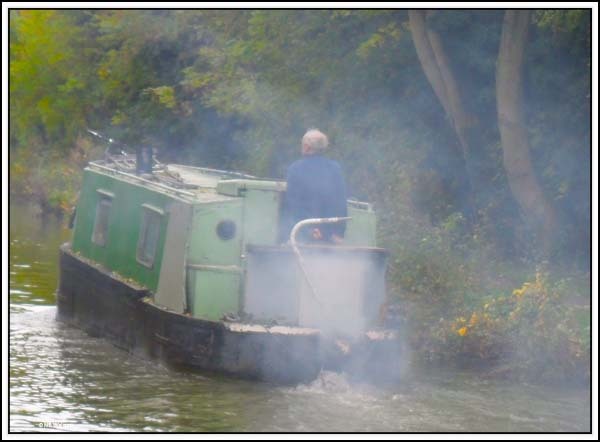 On the note of the smoke billowing from the boat - the owner was using pure, probably used, vegetable oil instead of diesel, or did you already know that? That is possible in older engines, with just a little diesel mixed in for good measure. Yes, I appreciate having an Apple minimizes the chances of suffering from a virus. But the same applies to Linux and that's not because Linux and Apple have the same business model. Lime Farm is good for diesel -- usually a good price, and you can declare what you like. We often used to stop there when we moored at Brinklow. You'll need to reverse in, and your bow will be sticking out in the canal. The little boat yard on the offside just after Newbold tunnel is also open again, and I've heard they're also good for diesel. You've just confirmed what the boater from yesterday told us. Although we were also informed the entrance into Lime Farm is quite shallow which might make it a consideration.